You have goals. You have money. You’re ready to budget. All that money in your accounts from Step 2? It's sitting in To be Budgeted at the top of your budget. The next step is to give all your dollars jobs, until To be Budgeted is zero. Start with Immediate Obligations, move to True Expenses, then work your way down your categories until To be Budgeted is zero. Not more, not less. Zero. Stay out of the red! Click To be Budgeted to move money back until it's green again. You have three ways to get your dollars where they need to be. You should try them all. You may have a favorite (but don’t tell the other ones if you do). You can type right in the Budgeted column. Need $90.00 for that Cat Toys category you just created? (Do you? Really?) Just type 90 and move to the next category. 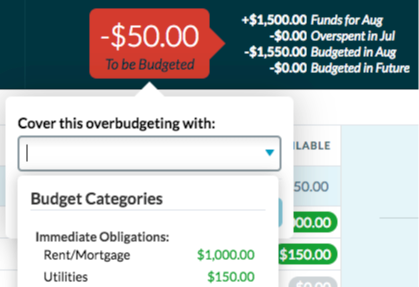 You can also click on To be Budgeted, enter the amount you want to move, select the category, and boom! Dollars are budgeted. Remember the goals you created and how they made categories orange? Orange always means you’re underfunded, and you can budget underfunded categories with a single click. This Goals + Quick Budget combo is how you can create a budget template. But that’s jumping ahead.